Mrinalkanti Ghosh (called “Mrinal” by friends and colleagues) is a 5-th year graduate student at TTI-C working with Madhur Tulsiani. Before joining the Ph.D. program, he completed his Masters at IIT Kanpur where he was working on topics in the intersection of Ergodic Theory and Computability Theory. 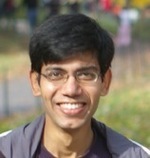 Later, Mrinal switched to the more practical field of Computational Complexity Theory. Currently, while he is taking a break from his busy TV watching schedule, he tries to think about approximation algorithms. Madhur Tulsiani is an assistant professor at TTI-Chicago, interested in various aspects of approximability and pseudorandomness. Madhur went to college at IIT Kanpur and spent some wonderful years at (the coffee shops around) UC Berkeley, while working on his Ph.D. with Luca Trevisan. Madhur enjoys biking, running, and aspires to one day learn some music (though it's perhaps better for his neighbors that he hasn't).